Coaching is the art & science of facilitating the performance, learning and development of ourselves and others. Many people & organisations are still getting to grips with what that looks like, how it can be done well and what needs to be created to allow such coaching to take place. Those who have found their way to do this go further still, looking at how to coach effectively and incorporate coaching skills in to their daily conversations. However, beyond all of this lies the deeper purpose of coaching in organisations. That is to enhance the understanding and performance of people in the organisation to reduce barriers and enable better outcomes. In the organisational setting, coaching must create value that can’t otherwise be realised for ourselves and for others. For that reason, it’s important that we never forget what is beyond coaching. My last session at the CIPD L&D Show was spent listening to Sean Kent (Freebridge Community Housing) and David Young (BT plc) share their quite extraordinary stories of how they have developed coaching skills in their organisation. …25% of your organisation being trained in coaching skills? …all of your managers being trained coaches? …using “Time to Think” approaches in Board and Management Team meetings? 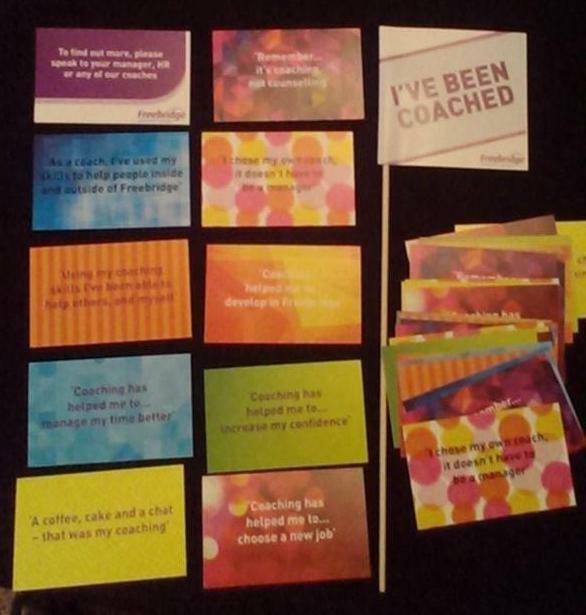 …your staff using coaching skills with your customers, clients or service users? That’s the ongoing and remarkable story at Freebridge, a community housing organisation based in that little corner of the world called West Norfolk. Little wonder that Gill White (CIPD) introduced the session as one that promised to be awesome! There’s something very important in here I think about purposefully exposing those leaders who haven’t experienced coaching to coaching experiences themselves. In fact, I now think we must proactively make sure all leaders are exposed to coaching so they are better aware of the potential of coaching in their organisation. If not, what are you waiting for? Sean then shared further their journey from those early stages a few years ago to how coaching is so integral to the way they work in the organisation today. Perhaps most encouraging was the confidence and enthusiasm shown by managers which was positively impacting the organisation qualitatively & quantitatively. In fact, Freebridge have now started using coaching skills in their engagements with tenants to better help resolve issues. For me that just underscores the potential business impact of enabling your leader-managers to coach effectively. David Young from BT plc then shared a quite different story in terms of scale but with a similar ethos, leadership and business focus. The driver in BT was again about organisational sustainability but was much more specific in terms of moving the leadership style in the whole organisation. Organisational analysis had shown that there was historically a “Command & Control” culture in their leader-managers. With a view towards sustainable profit growth, BT now needed to shift towards a healthier culture that remained performance focussed. The leadership style this would embody was described as “Challenging Leadership” – challenging in terms of ambition and growth, but supportive in terms of trust and loyalty. Core to this new default leadership style was aiming high, coaching people to succeed and creating energy. The degree of analysis and the specific and purposeful focus on an overall leadership style I think speaks to the needs of such large and complex organisations. Something to bear in mind. The approach to developing these skills was a comprehensive development programme supported with interesting resources and tools from the “world’s best thinking”. Underscoring this was a coaching pathway with 4 levels of expertise requiring different levels of training and even accreditation. As part of this BT used the TRAIN model (Target, Reality, Alternatives, Implement, Next) as a way to guide thinking & coaching philosophy but importantly not as a model to be used by rote. There’s a real sense of quality and coaching ethos that comes through in their approach. What I think is perhaps most impressive is the sheer scale BT are achieving here. They are two thirds of the way through training 15,000 leader-managers and their internal coaches have helped deliver over 11,500 hours of coaching. That by any means is a significant effort and commitment. More importantly, this shift to “Challenging Leadership” is demonstrably manifest in the business performance of the leader-managers who have been trained. If you want to demonstrate results beyond coaching, this is clearly what it takes. Interesting case studies here of supportive practices in a commercial context. One question. What do you mean by self-sustainability here? Both in terms of my intentions & I believe the approaches both organisations are taking, self-sustainability means that the wider organisation is able to maintain, sustain and grow through these approaches. Key for me is moving beyond external support and interventions from Executive leadership & OD to the point where a different strata in the organisation takes it to a different level(s).